Citation: C N Trueman "Sir Francis Walsingham"
Sir Francis Walsingham was a government administrator in the reign of Elizabeth I. Walsingham is principally remembered for his part in the trial and execution of Mary, Queen of Scots. Walsingham was born around 1532. His father, William, was a lawyer. Walsingham was well-educated and attended King’s College, Cambridge from 1548 to 1550. Between 1550 and 1552, he continued his studies in France and Italy and when he returned to England, he studied at Gray’s Inn in London. He once again returned to Europe to continue studying up to 1560. In 1562, aged about 30, Walsingham became a Member of Parliament for Lyme Regis. William Cecil, Lord Burghley, quickly recognised his talent and in 1568 Walsingham started to work for the most powerful non-royal in England. Walsingham was a talented linguist courtesy of the years he had spent in Europe. Cecil wanted Walsingham to use this ability to spy on foreigners in London who might present a threat to Elizabeth. Walsingham developed his own resources for this task and quickly had men working for him throughout the kingdom and in many of the major cities in Europe. Between 1570 and 1573 he served in the French Court as ambassador. This was the court that was dominated by Coligny. Walsingham’s main task in France was to arrange the marriage between Elizabeth and the Duke of Anjou the brother of the French king. This all came to nothing with the Massacre of St. Bartholomew’s on August 23rd/24th 1572. With the murder of Coligny, the Catholic factions in France were in the ascendant and Walsingham had to leave for England. His work was rewarded when he was appointed Secretary in 1573 and was knighted in 1577. As a Member of Parliament (for Surrey) he was also in an excellent position to keep his political master informed as to what was going on in the Commons. As Cecil was in the Lords, this ensured both Houses in Parliament were covered. Walsingham was a strong supporter of English military intervention in the Netherlands in support of the Dutch rebels. However, Cecil was more cautious and his view counted until the Treaty of Nonsuch in 1585. Walsingham continued in his task of trying to arrange a marriage between Elizabeth and the new Duke of Anjou (the former Duke of Alençon). In this he failed. Walsingham also worked to move Scotland away from her ties with France and drawing the King of Scotland more towards London. Potentially this was a difficult move as the king of Scotland was James VI and England had imprisoned his mother, Mary, Queen of Scots. However, there was little love between mother and son and James only made the briefest of ‘complaints’ when she was executed. It was Walsingham’s spy system that discovered the Throckmorton Plot (October 1583) and the Babington Plot (August 1586). The latter was so damning for Mary that she was put on trial for plotting to kill Elizabeth, found guilty and executed. 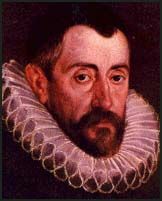 Sir Francis Walsingham was a loyal servant of the Queen. He died on April 6th 1590.